Assistant Storekeeper and other vacancies. Starting date for JKSSB online application form is 17-11-2017 and last date for form submission for this JKSSB vacancy is 11-12-2017. Online applications will be accepted though the JKSSB official website of www.ssbjk.in. Candidates will be selected for this JKSSB Recruitment of Assistant Storekeeper and other jobs through written exam and interview. For more details of JKSSB vacancy recruitment is given below. 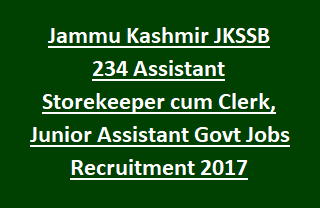 There are total 234 vacancies are available in this Jammu Kashmir Services Selection Board Recruitment 2017. As on 01-01-2017 age limits for General candidates is 18-40 years, for SC/ST/RBA/ALC/OSC 18-43 years and for Ex Serviceman 18-48 years. For Junior Assistant jobs Degree with typing speed of 35 words per minute and 6 moths computer training certificate. Application fee is Rs.350/- to be paid through online or offline or using CSC. Candidates will be selected for these JKSSB vacancies on basis or merit obtained in written test and /or interview. For exam pattern and syllabus you may refer official notification. Online application only accepted through JKSSB official website of www.ssbjk.in. Closing date for online form submission for this JKSSB Recruitment is 11-12-2017.